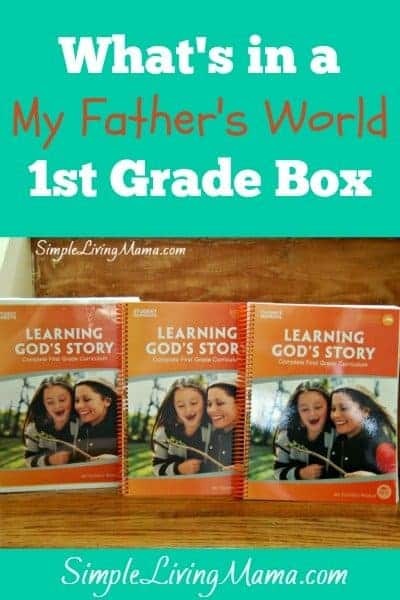 What’s in a My Father’s World 1st Grade Box? So, we made the decision to stick with My Father’s World. I bounced around between Ambleside Online, Simply Charlotte Mason, and me putting together our own curriculum. Ultimately, I read the reasons why I originally chose My Father’s World and decided to stick with it. I also decided that with a new baby, a box curriculum that tells me what to do is the best way to go! I ordered from My Father’s World while they had free shipping and we got the box a couple of weeks ago. I decided to show you what’s in a My Father’s World 1st Grade box! This is the basic edition! First up, take a look at the video I made of what’s in the box! The teacher’s manual includes everything you need to teach this curriculum. There is a supply list, a grid with daily plans, and book lists in the manual. Each curriculum comes with a pack of student sheets and a student workbook. 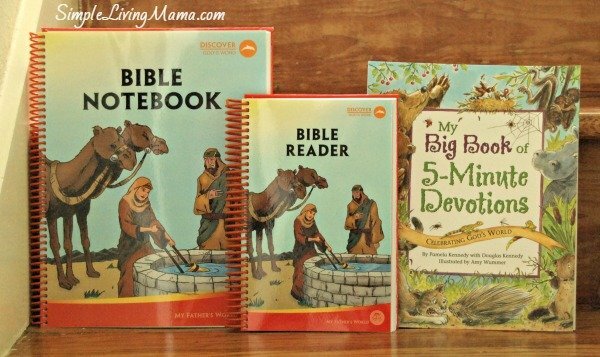 There is also a Bible notebook for the kids, a Bible reader, and a devotional. I love that my son is learning to read with a Bible reader. That is definitely one way to keep the stories from the Bible stored up in his little memory. We will be using the Complete Book of Math that comes with the boxed set. It’s a color workbook. 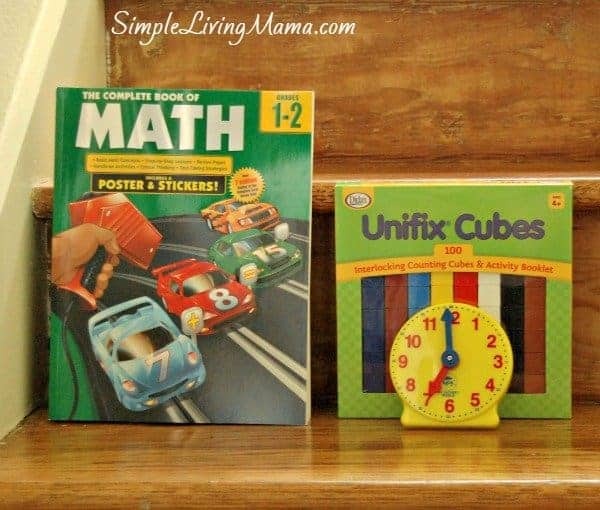 Included are unifix cubes and a clock to learn how to tell time. 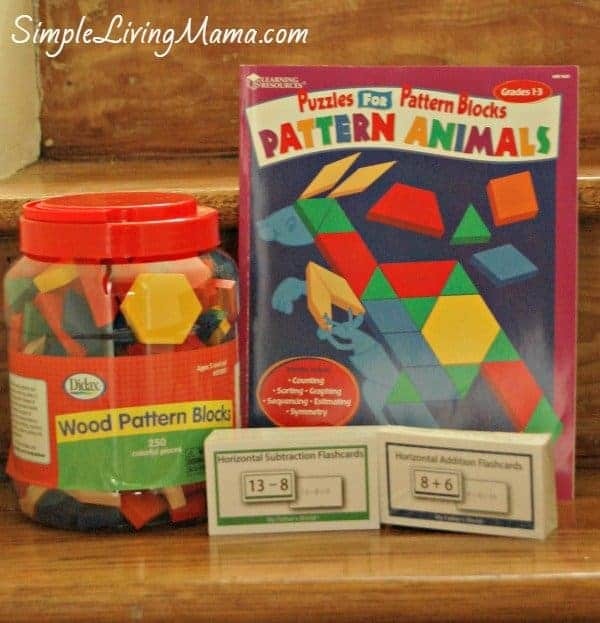 There are also addition and subtraction flashcards as well as pattern blocks and a book for those. My son already LOVES the pattern blocks. I’m storing them over the summer so they don’t get used too much. I also don’t want the pieces getting lost! 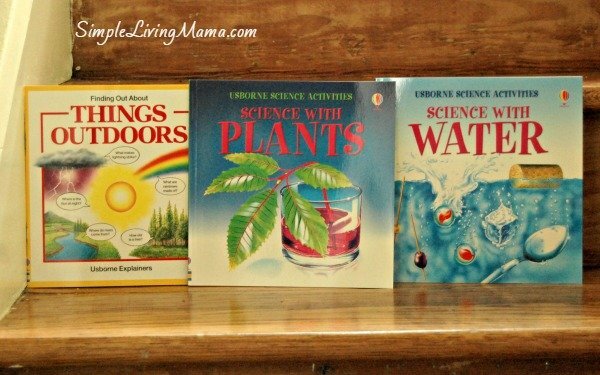 There are three science books with fun experiments! I like that there is still room for me to add our own music, art, and enrichment activities. Once I figure out what I will add to the curriculum, I will let you know! 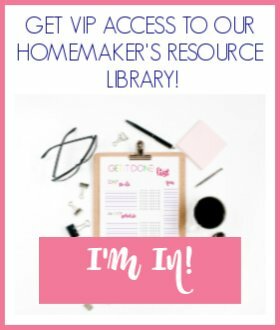 Follow me on Pinterest for more homeschooling ideas! 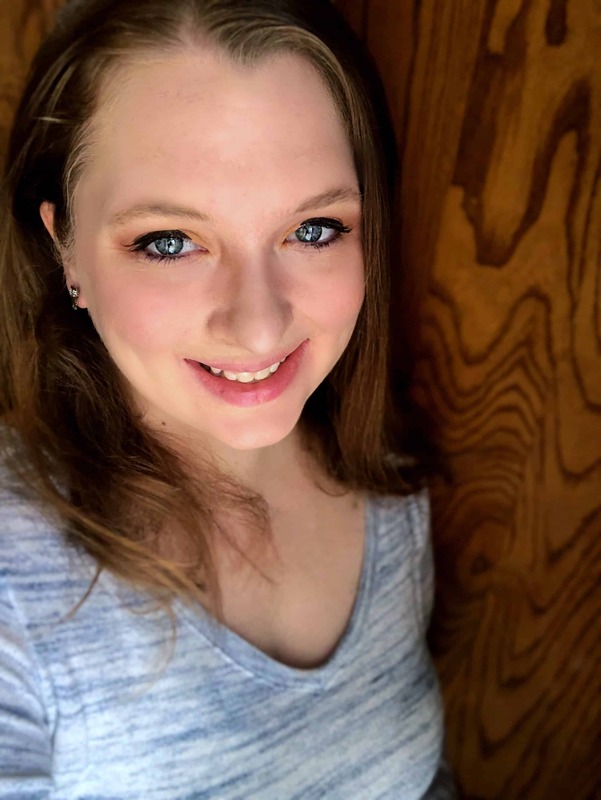 Visit Joanie Boeckman (Simple Living Mama)’s profile on Pinterest. Thanks for sharing this! Stumbled on your site while looking for MKW K stuff and came across this. We have been using MFW K this year, but I was debating about switching. 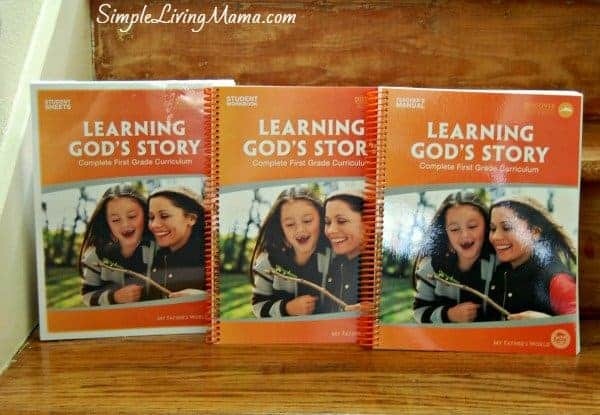 I, too, have been tossing around Simply CM and AO, as well as contemplating Tapestry of Grace and a few others. I didn’t remember seeing the math book in the 1st grade stuff, so I checked the date on your post and looks like we’ve been contemplating around the same time! 😉 Anyway, thanks for this info – look forward to exploring! Hi Christie! 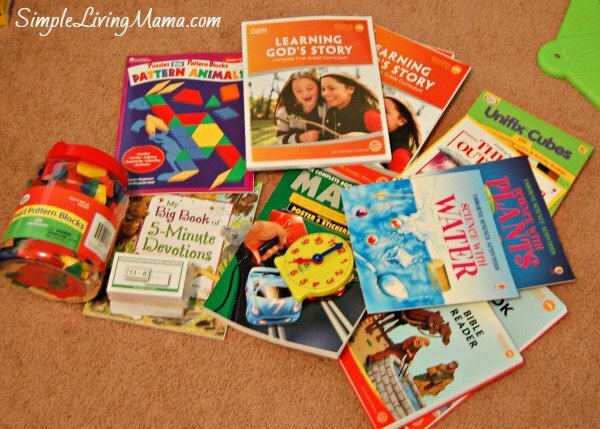 It’s nice to know I’m not the only mom who has gone back and forth on what curriculum to use! I think we are going to be happy in sticking with MFW. Good luck on your decision!